The S&P 500 is testing its 200-day moving average for the 3rd time. If it holds, that is a very good sign for the short-term. Buybacks come back in May. Accumulate your favorite stocks and ETFs bringing cash down closer to 15% than 25%. Seykota has repeatedly made the point that controlling psychological and emotional stimulus are the most important factors in being not only a successful trader, but successful in life. Seykota’s “trading tribe” is worth a visit to learn more. One of the four criteria in the Core 4 Investing Method is monitoring price trends of assets. Ultimately, price is truth. When investing, it is important to know that we are fallible. Having a complete process like Core 4 is vital to building our margin of safety on our portfolios. A company, sector or even a nation, can appear to have the secular winds at its back, have no government or central bank interference or even have outright support, and have great fundamentals with a durable comparative advantage. However, if the price of the asset we are investing in never rises, then we have to ask: is our thesis right?. Sometimes an investment thesis is right and the market is wrong. In those cases, the price trend merely affects our accumulation pattern. Other times, a price trend that moves against the analysis and narrative we believe, is a warning we should heed. Over the past 20 years, I have come to appreciate trend following and quantitative factors more and more as not only trading signals, but measures of market psychology. Applying the entire Core 4 can uncover massive opportunities when “the market” is misvaluing an asset, as well as, give us warnings far in advance of the crowd. The SPDR S&P 500 (SPY) has been flirting again with its 200-day moving average. So far, that important moving average has not broken down on a weekly basis, i.e. 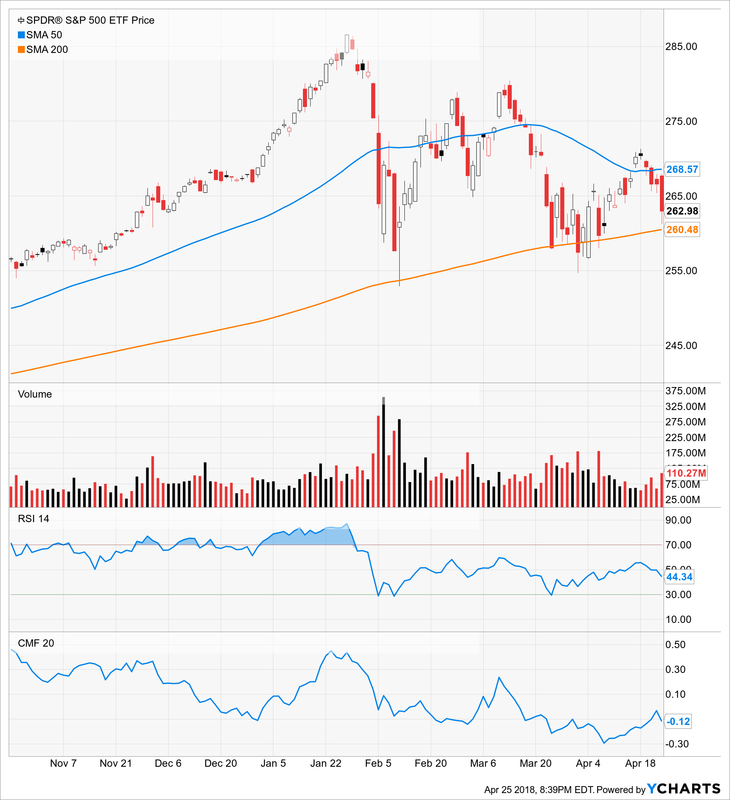 it has not closed below the 200-day moving average at the end of a week. 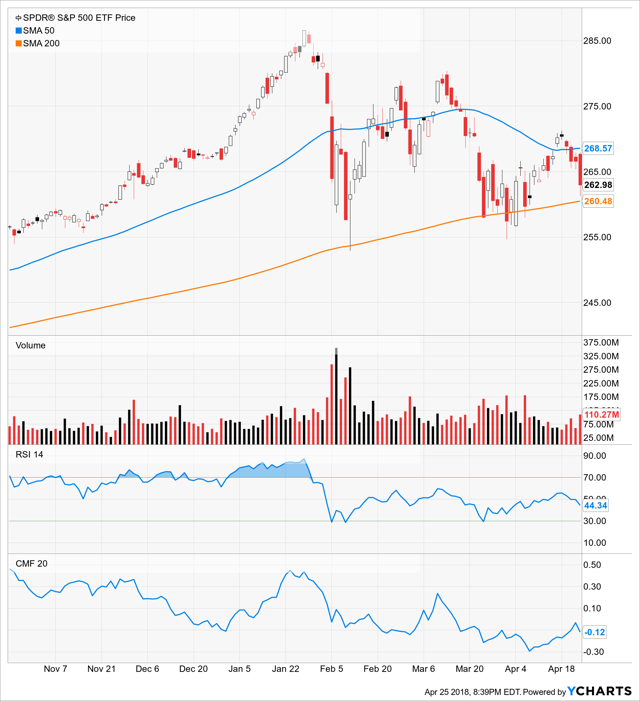 While moving averages are approached and breached with at least some regularity on a daily basis, it is the weekly chart that most serious traders will pay attention to, especially position traders, like me, who like to hold for extended periods of time. Trading the 200-day moving average is a topic I discussed several times, including in recent webinars. In President Trump’s Economy and Markets, we need to understand that things are indeed a bit different this time. 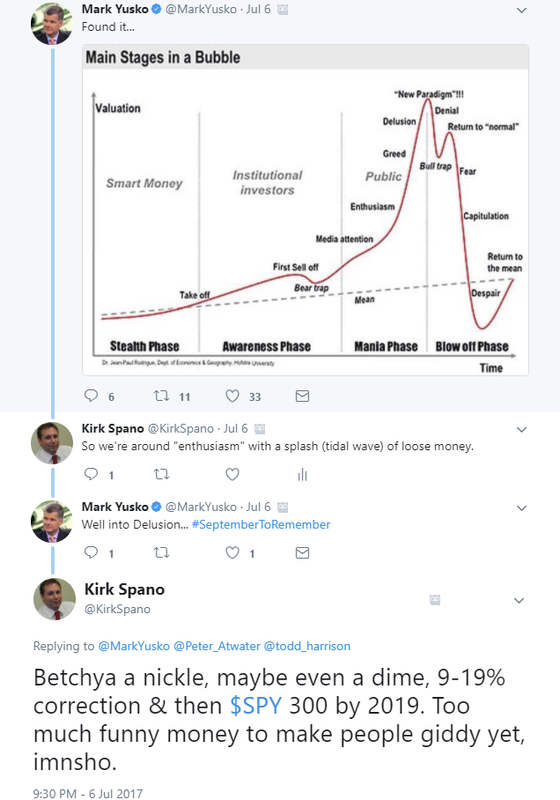 While I believe we will get a bear market in the next year or two, I do not believe we have had the breathless, hopeful, naive, euphoric final bubble blowing top yet. I could be wrong though. If the weekly does break below the 200-day moving average, then we do in fact have to evacuate more assets. Let’s see if a bounce occurs. During earnings season, like now, there is a blackout on buybacks. 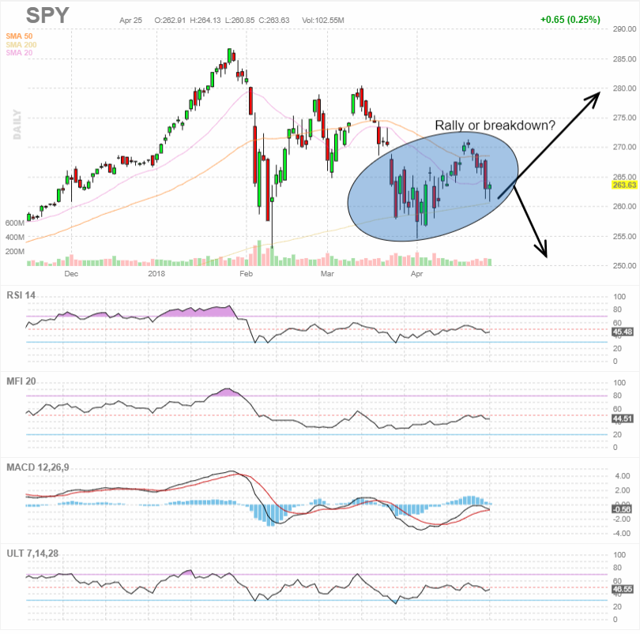 Take a look at this SPY chart. Look at money flow. The blackout on buybacks is 5 weeks leading up to earnings until the 3rd day after earnings. Notice that money flow has been coming down since the January rally and weakened more beginning the second week of March. Remember, this year, there is another wave of Boomers taking money out of retirement plans and pensions with net selling to make payments, but there is also the record buybacks. Those record buybacks are about to start hitting. Money flow is just starting to trend up again now that earnings season is about half over. I anticipate a significant rally the next two months on the buybacks, better news on trade and merely a sigh when the Iran sanctions are lifted since there won’t be shots (though that should be a catalyst for oil to rally more and oil stocks to follow finally). So, if I’m right, the buybacks are what is going to save this market for a while. If we don’t get more growth by next year, well, it was a great bull market. You know how I feel about growth improving much. I don’t think it will happen (although there are a couple scenarios which could workout, we’ll talk about those later). You’ll notice I’ve discussed everything on his list except using stops. I’m not a fan of stops anymore because most big market action happens in huge opening moves, i.e. opening way down, such as, on August 24th, 2015 when the market opened down 1000 points. Using stops on that “flash crash” would have taken you out of the market just when you wanted to be getting in. The solution in this age of algo driven instant market movements is to play the edges for reversals and hold extra cash except after blow off bottoms. Additional disclosure: I own a Registered Investment Advisor – https://bluemoundassetmanagement.com – however, publish separately from that entity for self-directed investors. Any information, opinions, research or thoughts presented are not specific advice as I do not have full knowledge of your circumstances. All investors ought to take special care to consider risk, as all investments carry the potential for loss. Consulting an investment advisor might be in your best interest before proceeding on any trade or investment. I am available for portfolio consultations.